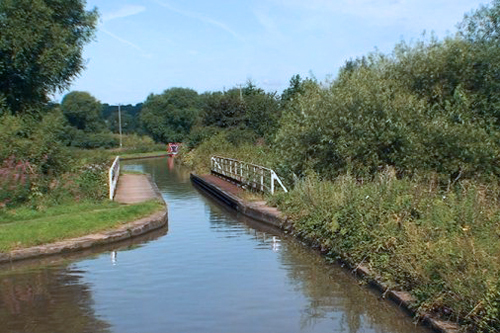 Looking for a great place to stop and explore during your cruise along the Trent & Mersey Canal? 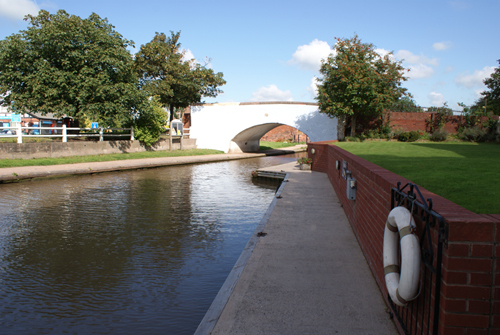 Middlewich is a fantastic town to explore and with a perfect location opposite the busy boating junction of the Wardle canal (Shropshire Union - Middlewich branch), Carillon Dock gives the perfect opportunity for a great holiday stopover. 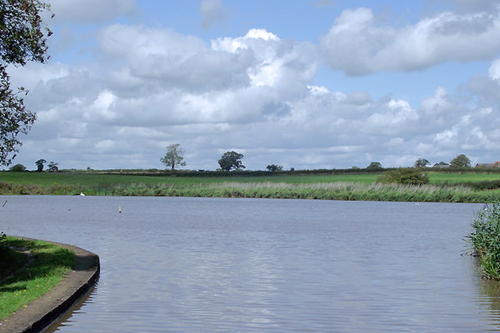 Situated next to bridge 169 this scenic dock is available for day/week hire/winter mooring. Our dock facilities include a safe and secure mooring point on private land, power, wifi and fishing rights (national license needed). Pump out and water fill up facilities are also within 50 yards of the dock should you need them. Currently, we have a boat at our dock and this is booked for the foreseeable future. If this situation changes we will, of course, make the dock available again via this web page. We were recently contacted by Cheshire East Planning Department about the use of our dock. It would seem that some "spineless" individual has made an anonymous complaint. We have reason to believe that person reads this page and we want them to know that we fully comply with all Cheshire East's rules and regulations. So much so that the gentleman from Cheshire East told us that he will be back in touch with the accuser to inform them the complaint is groundless and has been thrown out. We would suggest that if they have any further problems they might contact us directly to save themselves any further embarrassment in the future! The Wardle canal is the shortest canal in the UK at just 154 feet terminating with a single lock known as Wardle Lock. It was built in 1829 so that the navigation authority of the Trent and Mersey Canal could maintain control over the junction. Preston Brook was a sleepy rural village until the opening of the Bridgewater Canal which was later linked with the Trent & Mersey Canal in 1777 at a point just 11 yards inside the north end of the Preston Brook Tunnel (left). Part of the Tunnel collapsed in November 1981. Tons of debris fell into the tunnel below and damaged approx 37 meters long section of the tunnel bore. The Post Office above was damaged beyond repair and demolished. The damage to the tunnel was repaired using concrete sections. The site of the hole is marked by a round inspection shaft and if you look up whilst going through you will appreciate its size. The tunnel was re-opened in April 1984 ending the two and a half year separation of the two canal sections. The repaired section pictured is often referred to as the "Cathedral". 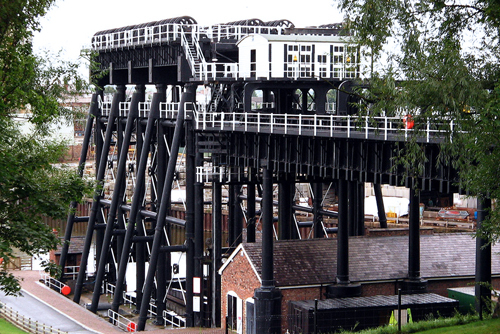 The Victorian Anderton Boat Lift (right), lowers boats fifty feet from the T & M to the River Weaver using two caissons (two sealable tanks into which boats can sail in and out of when at rest). Built in 1875, the boat lift was in use for over 100 years until it was closed due to corrosion in 1983. It was restored to full operation in 2002 after twenty years of disuse and was then the only operational boat-lift in the United Kingdom until the construction of the Falkirk Wheel in Scotland. This is a great place to stop and explore and the visitor centre has plenty to investigate. The boat trip is also well worth experiencing although it is a little expensive! Croxton Flash and Croxton Aqueduct (left) which was originally a complex cast and wrought iron structure of 14 feet beam (4.27 metres) crossing the River Dane. However, it was swept away by floods in the 1930’s and replaced by the present narrow structure on a new alignment. The original brick abutments and centre pier foundation are still visible on the bank and bed of the River Dane, immediately to the south of the present structure. 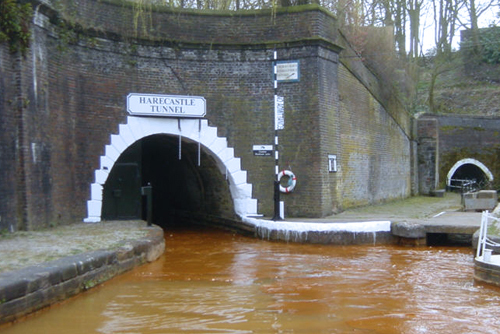 The Harecastle Tunnel (right) at Kidsgrove in Staffordshire. Made up of two separate, parallel, tunnels described as the Brindley (2,880 yards or 2633 metres) and the Telford (2,926 yards or 2675 metres). Originally boatmen using the Brindley tunnel had to 'leg' their boats through. Nowadays only the Telford tunnel is navigable due to subsidence from local mining operations. It is only wide enough to carry traffic in one direction at a time and boats are sent through in groups, alternating northbound and southbound. 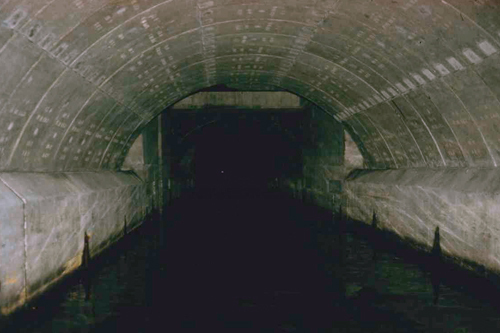 Since the tunnel was not designed for use by engine-powered boats, there are no ventilation shafts and venting is now handled by a large fan at the south portal. Those that like a good ghost story will be interested to know the tunnel has one! The ghost of one murdered Kit Crewbucket, whose headless corpse was dumped in the canal. During the 19th century, boatmen were so convinced of her existence that some would choose a long detour to avoid a trip through the tunnel. 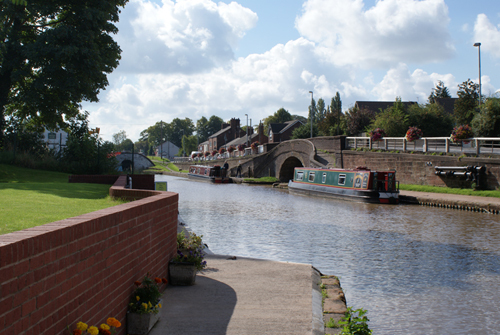 The town of Middlewich lies on the confluence of three rivers: the Dane, Croco and Wheelock. Three major roads also pass through it (A533, A54 and A530) with the nearby M6 giving good motorway links. The towns history dates back before the time of the Roman occupation, largely due to the value of the local salt resources. As a "wich" town, Middlewich is still an important centre for the extraction of salt. It is currently better known for its canals, heritage events and festivals. Since 1990 there have been initiatives to increase the volume of tourism into the town through events such as the Annual Folk & Boat Festival, the Roman and Norman festivals, and regular farmers' markets. In 2014 it has even been rated one of the most attractive postcode areas in the UK to live in.